Facts About Saturated Fats: The best healthy fats to eat. Facts about saturated fats are important! Saturated fat is not well understood. 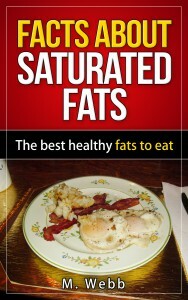 I wrote a guide book outlining the facts about eating healthy fats — and about saturated fats. For years I wrote articles for ballet dancers, and weight gain is always an issue. Dancers, other athletes, and many of the rest of us fell for the low fat diet paradigm for years. Yet, that didn’t help. Our hormones, our brain chemicals and our muscles depend on us eating healthy fats. … And much more. I hope you enjoy this web site, and my book, if you decide to purchase it. The source of your foods is important. Pastured, or grass fed animals produce the best meats and dairy products. This is because the balance of Omega 3 fatty acids and Omega 6 fatty acids is more beneficial if the source animals eat grass. Grain fed animals produce a higher ratio of Omega 6 Fatty acids. But, our health depends on a sufficient amount of the Omega 3 oils, so we should strive to get the best foods into our diet. Learn more about saturated fat. Included in my book are more references should you want the chemistry details.